Charleston, SC (Law Firm Newswire) August 8, 2018 – Steinberg Law Firm continues its efforts to prevent cycling and rollerblading accidents with its annual campaign that provides safety equipment and tips to Charleston-area kids. 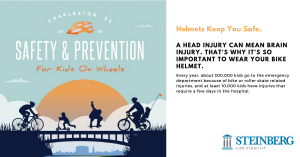 The 2018 Safe on Wheels campaign will distribute about 3,000 helmets along with reflective wear and bike lights, which is triple the amount donated in 2017, its inaugural year. In addition, the law firm has grown its bike safety program, which involves attorneys, school staff and police officers instructing students on how to ride safely. Steinberg Law Firm attorney Thomas M. White, a bicyclist himself, began the initiative after seeing the rising liability with the increasing amount of traffic in the area. When a rider is not wearing protective gear, the odds of a bike accident leading to a serious head or spine injury significantly increase. Each year, over 300,000 students go to the emergency room due to a bicycle or rollerblading accident, and about 10,000 of those hospital visits require stays of a few days. Kids in underprivileged neighborhoods are more likely to suffer a serious injury because they often lack the proper safety equipment. 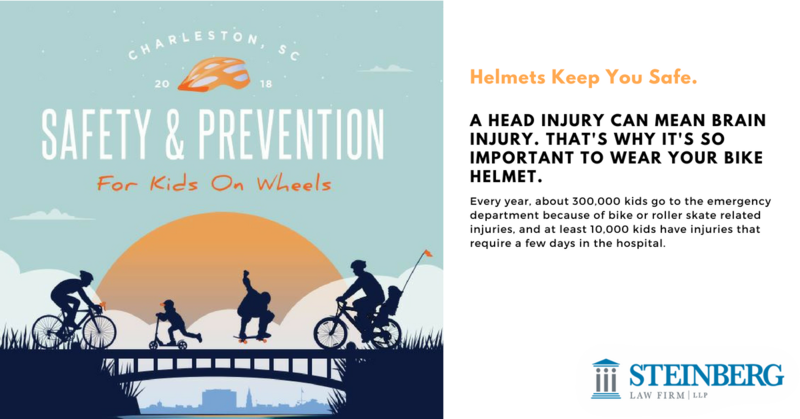 This year’s Safe on Wheels campaign gives free helmets and related gear to the students at College Park Elementary, Goodwin Elementary and Devon Forest Elementary Schools. The personal injury attorneys at Steinberg Law Firm are committed to helping their community grow as safely as possible, taking steps to prevent injuries before they occur.